England captain Harry Kane said the referee "bottled" awarding his side a late equaliser in their Nations League loss to Spain. Danny Welbeck thought he had levelled for the hosts deep into nine minutes of added time, but the goal was ruled out for a foul on goalkeeper David de Gea. Goals from Saul Niguez and Rodrigo gave Spain the 2-1 win after Marcus Rashford had opened the scoring at Wembley. "In big moments you need the referee to stay strong," Kane told Sky Sports. "In the big moments you need a firm referee who doesn't get decisions wrong under pressure. "Danny Welbeck stood there, De Gea went up, he caught the ball but as he went down he fell on Danny, no foul or anything, and the ball dropped. 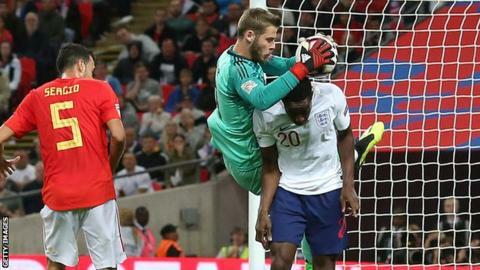 England manager Gareth Southgate also felt Welbeck's effort should have stood. "Their two centre-backs came together to block Danny," he said. "It is clear he stands there and De Gea goes over the top and drops the ball. Everyone can see it should be a goal." England's first game since they reached the last four of this summer's World Cup began well, with Rashford finishing off a superb pass from Manchester United club-mate Luke Shaw. However, Spain struck back almost immediately, with Saul firing in the equaliser two minutes later before Rodrigo took advantage of a static England defence to poke in following a free-kick. But England left the field feeling aggrieved after Welbeck's strike was ruled out by Dutch official Danny Makkelie. That came at the end of the nine extra minutes, which were added as a result of treatment for a head injury suffered by Shaw. Southgate confirmed that the left-back was conscious and talking in the changing room and will continue to be assessed. The defeat is England's first in a competitive fixture at Wembley since they lost a Euro 2008 qualifier to Croatia in November 2007, a run stretching back 24 games - and is Southgate's first home defeat as manager. England have also now lost three consecutive games in all competitions (having also suffered defeat to Croatia and Belgium in their final two games of the World Cup) for the first time since June 1988 when they were beaten by the Republic of Ireland, Netherlands and Soviet Union. Despite the loss, Southgate was pleased both with his team's performance against a talented side and the course England are on as they strive to continue the good work done in Russia this summer. "Spain pressed us and we didn't keep the ball well enough," he said. "I have to give the players credit. We could have folded and disappeared. In the last 25 minutes we came into the game and could have got a draw. "We are under no illusion that Spain were the better team for long periods. We are still at the early stages of what we want to do. "We are still finding our feet in playing out from the back. We can go back to an old style but we will never be a top team. Or we can stick with it and accept it won't always work. "The system in Spain has produced some of the best midfielders in the world. We are a different profile of players who can't play like they do. But we can move the ball. When we are match fitter we will function better up the pitch. It takes time. "We have come a long way. Today was a tough test in terms of pressing and a team who are so good in possession. We have to keep reviewing and looking at what we do. But we want to stick to the plan and get better at it. "There are individual positives and as a collective we gave everything." England will now take a break from Nations League duty, instead facing Switzerland at Leicester's King Power Stadium on Tuesday in a friendly. Spain will face World Cup runners-up Croatia, the other team in the three-man Nations League group, on the same night.